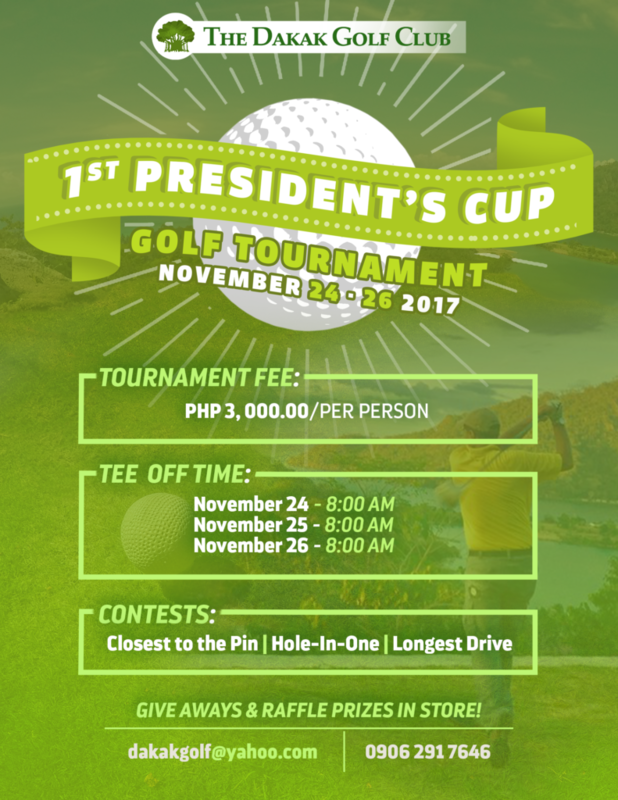 1ST PRESIDENT’S CUP (NOVEMBER 24-26, 2017) - Dakak Golf Club Inc. In celebration of the birthday of our President, CESAR GARCIA JALOSJOS, we are pleased to inform you that there will be a Golf Tournament, the 1ST DAKAK GOLF PRESIDENT’S CUP. The said tournament will be held at Dakak Golf Club, Brgy. Taguilon, Dapitan City, Zamboanga del Norte which is beside Dakak Park and Beach Resort on November 24, 25 and 26, 2017. Registration will start and shall take place 24th of November, 6:00 in the morning at Dakak Golf Clubhouse/Dakak Golf Office. Deadline of tournament fee payment shall be on November 5, 2017. (NOTE: CONFIRMATION OF GOLF IS VIA PAYMENT ON OR BEFORE NOVEMBER 5, 2017.) For payment details, please contact us at dakakgolf@yahoo.com or 0906 291 7646. Awards Night will be held on November 26, 2017, Dinner Buffet. G I V E A W A Y S, A N D R A F F L E P R I Z E S I N S T O R E ! ! ! Together, let’s hit balls and play like champion!